Collision repairers are back in the news again for another winter coverage angle. This time, they’re warning drivers to wash off the bottom of their vehicles to prevent salt and brine from corroding undercarriages. The Vicksburg Post interviewed Vicksburg, Miss.-based Lee’s Body Shop owner Lee Barber, who advised using an undercarriage spray wash weekly after the worst of the winter is over. He also recommended washing cars from the Gulf Coast. “We’ve had Mercedes come out of Chicago or New York and when they got it down here and raised the hood, there would be no inner wheel housing at all,” Barber said. A&J Paint & Body assistant manager Cody Brewer was magnanimous with Lubbock, Texas, station KCBD, advising consumers how they could avoid giving business to his Lubbock shop. We were curious why the galvanizing process — in which a zinc coating takes one for the team so the steel below doesn’t rust — applied to the undercarriage steel wasn’t enough. Columnist Joanne Will explored this and other corrosion prevention in this Toronto Globe and Mail column and found that the zinc can be chipped away by debris on the road. 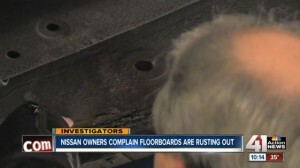 Another interesting corrosion issue raised came from KSHB’s February investigation into Nissan Altimas. Consumers had complained to both the National Highway Traffic Safety Administration and the station itself that their floorboards were corroding. “Based on the fact that this vehicle is almost 13 years old with 101,000 miles, Nissan feels the offer of 50% assistance was a fair goodwill offer to the customer,” Nissan spokesman Steve Yaeger told the station. The station’s research found more than 400 similar complaints about 2002-06 Nissan Altimas to the NHTSA. The agency doesn’t consider it an issue since regular inspections can tell there’s a problem. “Presently Nissan does not have any recalls or service campaigns involving floorboard rust issues on the Altima,” Yaeger said, according to the station. However, auto safety expert Bill Williams called the model-specific complaints “high,” according to KSHB. He said that kind of corrosion posed a risk to passengers.